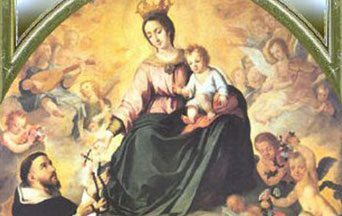 As we know, one great merit of the devotion to the Rosary is that it was revealed by Our Lady to Saint Dominic as a means to revive the Faith in regions ravaged by the Albigensian heresy. Indeed, the widespread practice of the Rosary revived the Faith. With this, the Rosary became, in times when there truly was faith in the world, one of the classic Catholic devotions. This led not only to the widespread making of statues of Our Lady of the Rosary around the world but the practice of praying the Rosary also became common among the faithful. Wearing the rosary hanging from the waist became an official component of the habits of many religious orders. Among the thousand things that we could say about the Rosary, I want to emphasize precisely this primary link between the Rosary and the virtue of faith, and between the Rosary and the defeat of heretics. The Rosary has always been considered an extremely powerful weapon of the Faith. We know that the virtue of faith is the root of all virtues. Virtues are not true unless they spring from a living faith. Therefore, there is no point cultivating other virtues if one neglects faith. 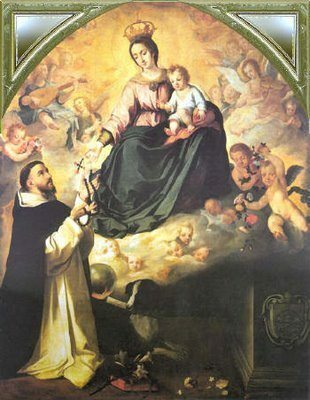 Our Lady gives the Rosary to St. Dominic of Guzman. 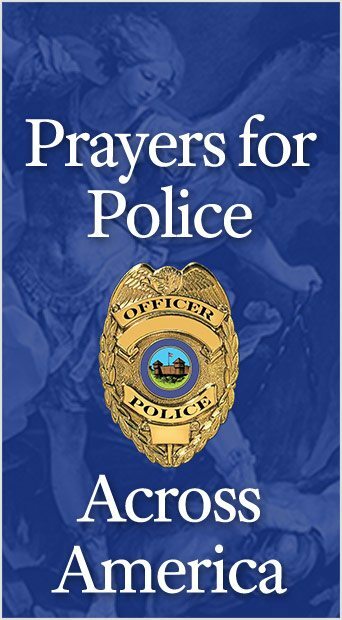 This devotion is particularly meaningful to those whose lives are marked by a continuous, legal and doctrinal struggle on behalf of orthodoxy, and who consider the victory of orthodoxy and of the Counter-Revolution in the world the ideal of our lives. This is because it establishes the link between our lives and devotion to Our Lady, who clearly appears here as the one who alone crushed all heresies, as the liturgy says. To a great extent, she has crushed them through the Rosary. This text is an adapted transcription of a tape-recorded lecture by Prof. Plinio Corrêa de Oliveira to TFP members and volunteers; its spoken style has been maintained and it has not been reviewed by the author. This entry was posted in About Our Lady and tagged Albigensian, devotion, Devotion to the Holy Rosary: Powerful “Weapon” of the Faith, Dominic, faith, faithful, heresy, holy, orthodoxy, Our Lady, power, ravage, religious, rosary, Saint, virtues, weapon by Plinio Corrêa de Oliveira. Bookmark the permalink.